IT’S HARD to believe that a small British Gujarati woman called Jayaben Desai has a hallowed place in the history of British modern industrial relations – but that is precisely how she is seen today. 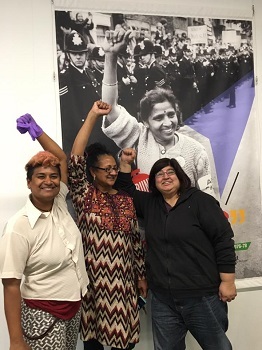 Some 40 years ago, Desai, an East African Asian, led a now infamous strike against her employers, Grunwick and sparked a revolution of sorts, almost unwittingly. 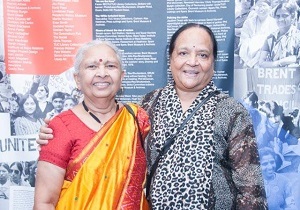 Now an exhibition called “We are the Lions” celebrates her and the others who joined her in what was a two-year struggle to win better pay and conditions from their employers. Filled with pictures, posters, video footage and artefacts, it gives an almost blow-by-blow account of the dispute and presents a vivid and stirring picture of that time, a period of great firmament and social change. Some of the artwork was inspired by Russian Constructivism – a movement created in the Soviet Union and closely linked to workers’ struggles and Socialism. Grunwick, itself, was a camera film processing unit and thrived in the days when people had to send their holiday and family snaps in to be processed and returned as photographs. Fed up with being paid less, treated badly and ordered to do overtime at just a moment’s notice, Desai took a stand. “What you are running here is not a factory, it is a zoo. But in a zoo there are many types of animals. Some are monkeys who can dance on your fingertips, others are lions who can bite your head off. We are the lions, Mr Manager,” thundered Jayaben Desai. The exhibition has been curated Poulomi Desai (not related), the artistic director of Usurp Art, which helps to engage artists and their work with hard to reach communities. It is on show at Willesden Library and not far from the original Grunwick premises. Striker Vipin Magdani said: “Being on the picket lines outside the Grunwick factory was an important moment in my life. She agreed that the strike in some ways represented a turning point, a previously hostile working-class element (to immigrants) rallied to support the ‘sari strikers’, as they were known. “The exhibition illustrates that regardless of your background and relative sense of powerlessness, you can take a stand and organise – it also shows the importance of solidarity and overcoming difference for a wider goal,” she added. For her, the strike and the dispute it came to represent have direct lessons for us today as well. “We also have the largest movement of displaced peoples in the history of humanity today and inequality between rich and poor is extreme, therefore to talk about the intersections of race, gender, class, and equality are highly relevant today,” argued Desai. A group called The Grunwick 40 was formed last year to keep alive the legacy left by the strikers. It is formed of local people, some of the original strikers and members of the Brent Trade Council, a union group which was the first to back Desai and the strikers. The Heritage Lottery Fund has donated £24,800 to the Grunwick 40 and a further £19,000 was raised through a crowdfunding initiative. It is hoped the exhibition will go on a national tour after its stint in Willesden. At that time – 1976, women had not long been in the workplace, non-white immigration was a hugely contentious issue and there was political instability – with some trade unions and working-class organisations deeply opposed to both immigration and industrial reform. But Grunwick now is regarded as a turning point in the unions and race – many trade unionists supported the strikers, even if their leadership and officials were less supportive or vocal. Jayaben led a group of workers out on August 23 1976 (which was one the hottest summers on record and Grunwick did not have air conditioning). More soon joined in, and postal workers also supported the strikers by not delivering mail and requesting Grunwick to collect it themselves. The dispute was bitter and protracted and there was much legal toing and froing and some credit the dispute with contributing to the Conservatives’ General Election win in 1979 and the ensuing radical trade union reforms implemented by Margaret Thatcher and her government. Grunwick was one of a long line of industrial disputes in the 1970s with Britain often dubbed ‘the sick man of Europe’ with its faltering economy and lack of a clear direction. The strike petered out in 1978, with no clear victor; Grunwick’s business was on the decline as cheaper processing machines came into the market and local chemists took advantage. Desai died in 2010 and was still recognised – a cause célèbre at the time – she remains an iconic figure who fought for women’s and workers’ rights and was one of the first Asian women to achieve a national prominence – however unlikely that might have seemed at the beginning of 1976. Officially, the exhibition is a joint project run by Brent Trades Council, Willesden Green Town team, in partnership with Brent Museum & Archives, and set up to commemorate 40 years of the Grunwick strike, and funded by Heritage Lottery Fund, Near Neighbours and donations from individuals and organisations. ‘We are the lions’ – until March 26 2017, Brent Museum & Archives, The Library at Willesden, 95 High Road, London NW10 2SF from 9am08pm, Monday to Friday, Saturday and Sunday, 10am-5pm. Free Admission.